With Christmas just around the corner, everyone is starting to really feel an excited buzz and the festive preparations have begun in earnest. The weeks leading up to the big day can be a busy time and you might be left wondering just how you’re going to get everything done! To help, we have extended our opening hours, offering you precious extra time in which to grab the perfect gift from our contemporary collection of country clothes and accessories. 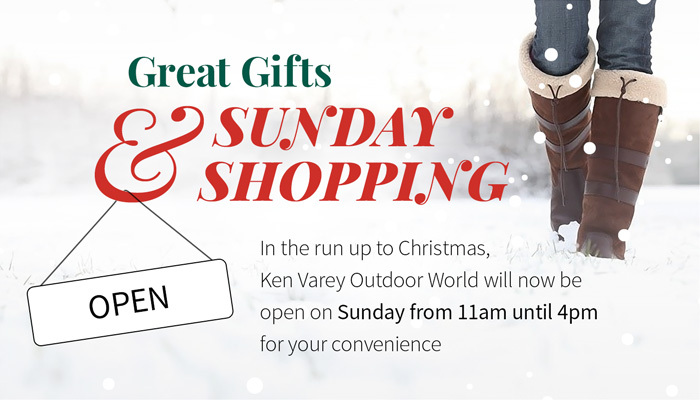 In the run up to Christmas, Ken Varey Outdoor World will now be open on Sunday from 11am until 4pm for your convenience. We are well aware that our product portfolio is extensive and that customers can sometimes have difficulty knowing where to start – here are three great gift ideas to inspire you..
With Storms Abigail, Barney, Clodagh and Desmond battering the country one after another, we have already had our fair share of bad weather over the past few weeks. Unfortunately, it looks set to continue with predictions being gloomily made that this winter will be the worst for half a century! Dubarry shoes and boots are manufactured from raw materials of exceptional quality by skilled engineers, consistently upholding the impeccable standards that have allowed the company to successfully expand into a global market over the 70 years it has been established. As well as their signature footwear, Dubarry also produce an exquisite range of accessories – including belts, bags, scarves and jackets – that will ensure you can find the right gift for anyone. One of the greatest delights of the country is walking and nobody enjoys it more than our treasured and pampered pooches! Treat your faithful friend this Christmas with a smart new collar & lead and make sure they keep coming back with one of our handy dog whistles. If the owner deserves a treat too then check out our gorgeous Joules dog-print wellies – a kitsch delight! We look forward to seeing you at Ken Varey Outdoor World soon – you can find our stores in Clitheroe, Skipton and Atherton. Don’t forget that we will be open for business on Sundays from 11am until 4pm in the run up to Christmas.